With the new year already in full swing, lots of us are looking for ways to keep our new years resolutions and work off those mince pies. If this sounds like you, you’re not alone. One in five adults in Hertfordshire currently does less than thirty minutes of activity a week. This means they are missing out on a wide range of physical, mental and social benefits. So make New Year, New You your motto and get active using ParksHerts. 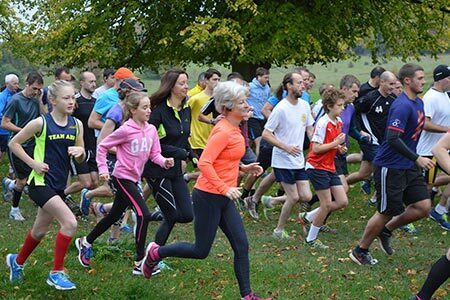 5km Parkruns are held at 9am every Saturday of the year and are free to enter. They take place across Hertfordshire and offer an opportunity to get outside and meet with your friends and family whilst enjoying the beautiful surroundings. Parkrun is for everyone, whether you’re young or old, male or female, fit or unfit, able-bodied or not, you’re always welcome and it’s about taking part whether you walk, jog or run. Please register at www.parkrun.org.uk before your first run. Children under 11 must be accompanied by a parent, guardian or appropriate adult of the parents choice. For those aspiring young runners, 2km Junior Parkruns take place at 9am on a Sunday morning. Runners must be aged from 4-14 years and children under 11 must be accompanied to/from the event by a responsible adult who must remain in attendance for the duration of the event. Hertfordshire Health Walks are a countywide programme of free, volunteer – led walks, which aims to help people get outdoors, get more active and therefore reap the benefits. The walks are all sociable and you don’t need any special equipment to join in other than some comfortable shoes. To register to walk either sign up online at the Countryside Management Service website or just turn up a few minutes early for your first walk. Full listings of currently running local walks in and around ParksHerts Parks are available on our Events pages. The programme runs all year round and offers choice of different walk grades, start points and times which include weekdays and weekends or evenings in the summer. For more information and a copy of the Health Walks leaflet please go to your local library, GP surgery or council office or visit the Countryside Management Service website here. If getting your hands dirty is more your scene, ParksHerts still has opportunities for you. Go along to Oxhey Woods on the first and third Sunday of each month, or Croxley Common Moor on the second Sunday of each month for their volunteer sessions and help maintain these beautiful open spaces. Further details are available on the Events pages. Don’t forget through, simply getting out and into a park can help improve both your physical and mental well being. Some of our parks have routes already identified which can be filtered to find the one that suits you best. Simply choose your favourite park from the list and have a look. New Year, New You! is the January focus for Hertfordshire’s Year of Physical Activity 2018 which was recently launched with the aim of making Hertfordshire the most active county. The year will highlight the many and varied ways to get active and improve your health across Hertfordshire and each month will focus on a different topic. For more information, or to get involved in the campaign, visit the website here, or contact Jane Parker at hertsyopa18@herts.ac.uk.